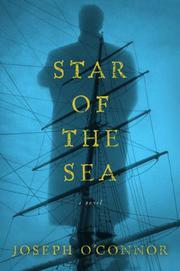 A bumptious epic about a New World–bound ship Star of the Sea, full of raging immigrants, conflicted aristocrats, and a flint-eyed murderer. It’s the tumultuous year of 1847 when O’Connor’s gallimaufry of characters board a “coffin ship” bound from Ireland to New York. Hundreds of famine refugees huddle in steerage, while just above them a handful of first-class passengers reside in splendor, though they’re rent with hidden intrigues—and all hear the thudding gait of the loner with the bad leg who wanders the ship at night. At center are two men in particular: the aristocrat David Merridith and the limping loner, Pius Mulvey. Merridith is a self-loathing scion of a British family that had long owned a large chunk of Ireland. When the estate’s fortunes crashed, at the height of the famine, most of the tenant families were put off the land—while corpses littered the countryside. Now on his way to New York with wife and children, Merridith has many secrets, most concerning their servant, Mary Duane. Pius is of a different stripe, though he hates himself just as much: having abandoned a pregnant girlfriend and his slightly mad brother in Ireland, Pius made himself into a high-living thief in London’s East End, one night even giving great inspiration to Charles Dickens, who was slumming for material. Later come to ruin, Pius has been embarked on a mission by some Hibernian thugs who won’t take no for an answer: kill the English scum David Merridith. Told mostly in flashbacks, and mostly through the highly arched voice of first-class passenger and journalist Grantley Dixon, this is the sort of gloriously overstuffed story that could be told in hushed breath over fifteen or so lengthy installments on late-night radio. Irish author O’Connor (Yeats Is Dead!, 2001; etc.) pulls out all the melodramatic stops for a thrilling tale without once losing his eye for the right detail or his ear for the perfect phrase.